So we can all agree it doesn't top "Let It Go" -- but how could it?! Still, it's on par with other favorites like "Love Is an Open Door" and "Fixer Upper," and is the first time the entire cast has appeared on one song, with little cameos by Kristoff (Jonathan Groff) and Olaf (Josh Gad). Anna: "Elsa, I'm thinkin' you might have a cold." Elsa: "I don't get colds. Besides...the cold never bothered me anyway!" In the end, it's a great additional to the Frozen catalogue. We love that they're sticking with girl power -- Elsa is Anna's date for her birthday, not Kristoff -- and we're actually excited to hear little kids do covers of this one. We can't wait to hear all that fake sneezing! THOSE LITTLE SNOWMEN ARE SO CUTE! They're called "snowgies" and they're probably not at all what you think they are: Producer Peter Del Vecho told Yahoo! Movies they don't have anything to do with Olaf, they're Elsa's snot. Gross. But still so cute! We can't wait to have a stuffed animal snow booger of our own when they inevitably get made! And then see a whole short film of the snowgies before Frozen 2 comes out! Please! Give us more Frozen! WE NEED MORE FROZEN! 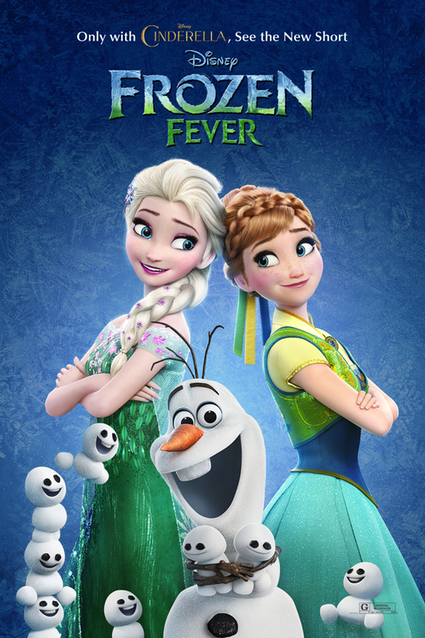 Frozen Fever premieres before Disney's Cinderella, in theaters tomorrow!